The Advantages of Control Booths | BIG Enterprises Inc. 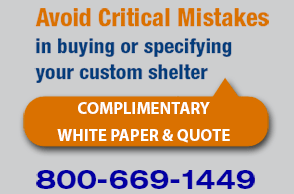 There are numerous advantages in choosing the right control booths. To ensure the product meets your expectations and requirements, it is important to purchase a booth from a reputable and trusted source. That way, you have confidence in the materials, workmanship, and overall performance of the booth. Prefabrication – Although you can have something built onsite, an even better option is a prefabricated booth. In addition to being more cost-efficient, you can move the booth where ever needed. Structurally Sound – When purchasing from B.I.G. Enterprises, an industry leader, you know the booth is structurally sound. These booths have a heavy-duty welded steel construction. Electrically Wired – When the booth arrives at your company, it is quickly assembled complete with all electrical wiring. This allows the assigned worker to take his or her post almost immediately. Being electrically wired, the booth accommodates all types of devices, including computers, lights, landline phones, and much more. Customizable Size – Although B.I.G. booths typically range in size from 3 by 3 feet up to 12 by 24 feet, we can customize the booth to whatever size you need. Amenities and Features – You have a wide range of choices as far as amenities and features. For example, we can add an HVAC system, special flooring, windows, doors, locking mechanisms, and insulation if needed. In fact, when choosing a B.I.G. product, your booth can be made to resist both bullets and blasts. Protection – The biggest advantage is that booths protect your business and employees. The booth sits at the exterior entrance of your company, becoming a checkpoint for foot, vehicle, and material traffic. Not only does it control what goes into and out of your business, the booth helps deter criminal and terrorist activity. Peace of Mind – As security threats increase, it is important to provide your workers with peace of mind. Your employees deserve to arrive at work knowing the facility is fully protected. With strategically placed control booths, your employees will focus more on being productive than on concerns over safety. To enjoy the many advantages of control booths, it is imperative that you purchase from the right company. At B.I.G. Enterprises, we would love the opportunity to provide additional information and assist with your order.